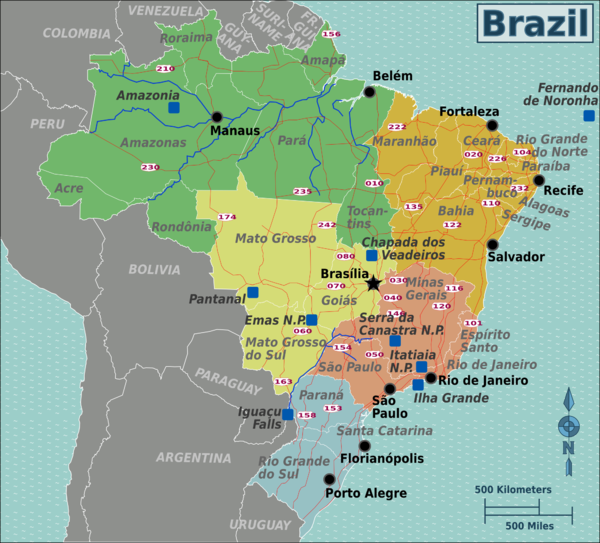 Brazil is the largest country in South America and the 5th largest country in the world by land area. It is an extraordinary country with beautiful people that’s rich in cultures, colors, flavors, languages, and customs. Much of the Amazon Rainforest, the largest tropical rain forest in the world, covers northwestern Brazil. The Amazon River, the longest river in the world, is considered to be the life force of the Amazon Rainforest and home to many plants and animals, such as the Boto (Amazon River dolphin), Amazonian manatee, giant river otter, and the infamous anaconda. If you’re ever planning to visit the beautiful country of Brazil, keep reading this blog post on how to build the most economical flight itinerary using the online airfare deal finder tool: SkySurf.Travel. I was able to build a single-trip flight itinerary composed of 15 cities in Brazil for the total price of $873 USD (including taxes). That’s cheaper than many round-trip international flight tickets. You can also use SkySurf.Travel to build the most cost-effective itinerary to anywhere in the world, from anywhere. For more examples on how to save lots of money on flights to several other destinations, click on the blog links located on the left panel of this blog. First, I clicked on the “Mutil-city” tab. 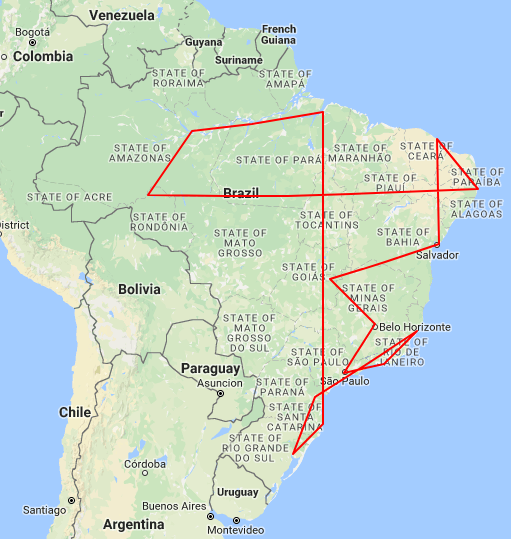 Next, I entered where I’ll be traveling from, which in this case is “Brasilia”. I then selected my departure date; since I’m flexible with dates, I selected “September 2017” to find the cheapest flights in September 2017. 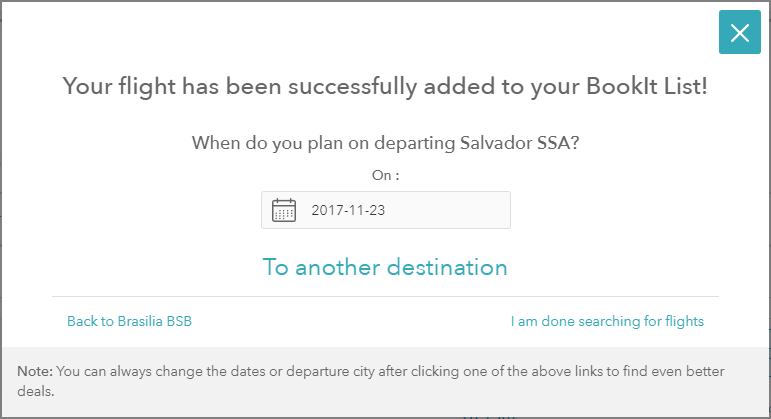 If you know your exact dates, you can select your exact travel dates. Finally, I clicked on the “Search Best Deals!” button and a list of the cheapest flights were displayed. I decide to stay in Belo Horizonte for 4 nights and select the date September 29, 2017 for my departure. I then click on the “To another destination” link and new results appear. My cheapest option is to Sao Paulo for $29. I add this flight to my itinerary by clicking on the “+Add to BookIt List” button, and repeat the above process until I’m back in Brasilia. The above is just an example flight itinerary I’ve composed for this blog entry. You can build your flight itinerary anyway you desire and select the destinations you want to travel to. It’s possible to build an even cheaper itinerary than the one used for this example. Christ the Redeemer: A must-see attraction in Rio that’s recognized as one of the New Seven Wonders of the World. Iguazu Falls (Foz do Iguacu): The largest waterfalls system in the world. Baia do Sancho (Fernando de Noronha): Baía do Sancho has been named the best beach in the world by Tripadvisor. Rio da Prata (Bonito): Rio da Prata the 3rd clearest water in the world. Great amounts of underground limestone in this river filter the water and make it clear. Theatro Municipal do Rio de Janeiro. Built in the beginning of the twentieth century, it is considered to be one of the most beautiful and important theatres in the country. Paraty Historic Centre (Rio de Janeiro): Paraty´s Historic Center dates back to the years 1820s. The Historic Center, considered by UNESCO as “the most harmonious colonial architectonic set”, is declared a National Patrimony. Amazon River Cruises: Cruise the Brazil Amazon River. Amazon Rainforest Tours: Journey into the heart of the most biodiverse place on the planet. And plenty more to see and do! Whatever you plan on doing in Brazil, whether it’s sightseeing or enjoying the nightlife, one thing for sure is you’ll never get bored. Brazil is known for its gregarious and energetic population. One of the best aspects of Brazilian culture is its music. Dance the Samba, Carimbo, or Forro; or enjoy a Samba Show… whatever you like, Brazil awaits you!